THANK YOU FRANK & JAN!! LOVED our lunch today with Frank & Jan Solava. 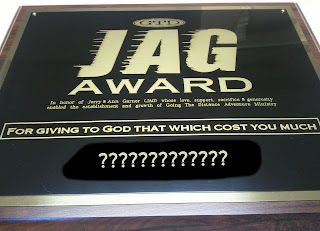 We were so happy to present them with a JAG Award (GTD's highest award) for 10 straight years of ministry partnership. Wonderful people!! God bless them! 2 WEEKS TILL SWAMP THING! 2 WEEKS UNTIL ONE OF THE MOST UNIQUE HIKING DESTINATIONS IN THE WORLD... SWAMP THING - THE EVERGLADES BACKPACKING TRIP!! 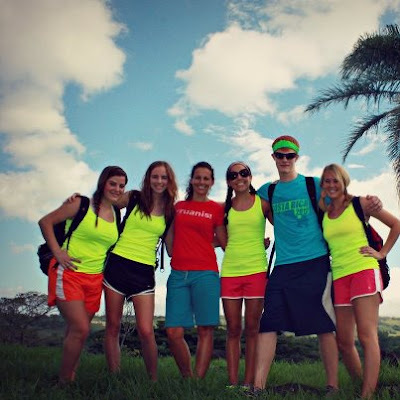 Dec 14-16, 2012... sign-up today!! GTD is looking for people interested in spending their summer on the Costa Rica mission field to serve as interns. We have opportunities available during the months of May, June and July. Please contact GTD (Laurie) for more information! Finishing up our thank you notes from last week's banquet... so thankful for so many people to thank!! R U Ready For Adventure!?!? Swamp Thing is a 3 day Christ-centered journey into one of North America's unsung wild places - the Everglades of south Florida. The Big Cypress Swamp is a spectacular, rugged, rare, subtropical landscape experienced by very few adventurous souls each year. It is hauntingly beautiful. And it is enormous, covering 2400 square miles. 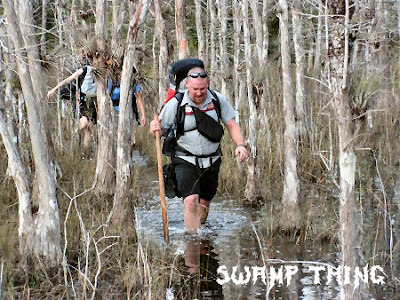 GTD's Swamp Thing is a 3 mile out-and-back (6 miles total) hike through the fresh water swamp that flows into the Everglades. We will trek in 3 miles and camp for 2 nights on a small pineland island which is surrounded by an endless river of grass, cypress trees, and marsh swamps. Each day we will explore some of the rarest terrain in the world. About 75% of our hiking trail is through swamp water anywhere from ankle to knee deep. This is an adventurous and challenging hike that will cause a sense of wonder and praise deep within your soul as you see the creative genius of an Almighty God. Each day we will start the morning with personal devotions and each night we will spend some time focusing on a Biblical topic. Only through God's amazing power can the grunge of a swamp be used to refresh your soul. Come and see why adventurers haven't experienced anything until they've experienced The Swamp Thing. THANK YOU JESUS!! WE DID IT!! We exceeded the goal last night!! Our current fundraising total from our 2012 Annual Fundraising Banquet is..... $23,543.... that's $3,543 beyond our $20,000 goal =). Even though last night was one of our lowest attended Annual Banquets, it was one of the absolute best nights we have ever had during the past 10 years. It was a special night full of substance. We want to give a special THANK YOU to the following people: Keynote Speaker - Pastor Trevor Hersey - who preached a powerful message that won't soon be forgotten, TEAM USA Chaplin Asif Shaikh who provided a wonderful Invocation & Donation Appeal, great testimonies by Tiffany Weaver - Jenna Arnal - and Pastor Philip Cochran, & Laurie Finger for her great speech about our Costa Rica Program. In addition, we want to THANK the following people who volunteered to help work at the banquet: Traci, Erin, Jason E, Jason M, Adam, Jerry, Ann, Tessa... I hope I didn't overlook someone!! WE COULD NOT HAVE DONE IT WITHOUT YOU!! AND, OF COURSE, THANK YOU TO ALL WHO ATTENDED & DONATED AND SIGNED UP TO BE MONTHLY PARTNERS!!!! 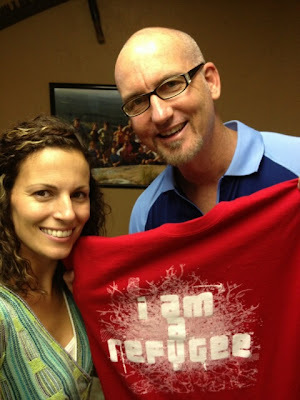 YOU MADE A HUGE DIFFERENCE IN OUR MINISTRY THROUGH YOUR AMAZING GENEROSITY!!!!!! GOD BLESS YOU!! Our official final total for the 2012 Annual Banquet won't be finalized until Dec 31st as we continue to receive funds over the next 7 weeks. 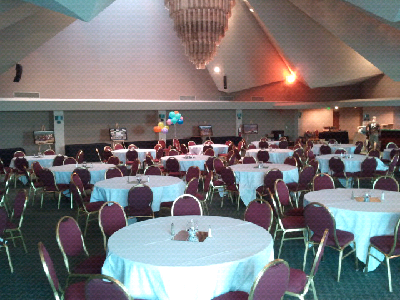 The Banquet Set-Up Is Going Great!! WE ARE WITHIN $2625 OF THE GOAL!! PTL, we have already raised $17,375 towards our $20,000 goal! That only leaves $2625 left to raise to hit the goal!! YOU CAN HELP PUT US OVER THE TOP by making a one-time donation to GTD and/or by signing up to be a Monthly Partner for the next 12 months!! Don't underestimate the difference $10, $20, or $30 per month can make... that's equals $120, $240, or $360 in the course of 1 year and makes a big difference in a non-profit organization like ours which has very little overhead expenses. Click on this link to donate and/or become a Monthly Partner. 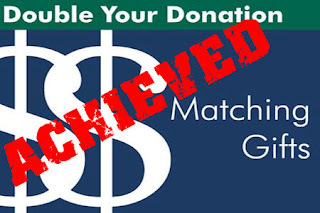 Great News: As of last night we achieved the Donor Matching-Gift Challenge of raising $3000 so that it could be doubled to $6000!! This is part of the fund raising drive for our Annual Banquet and goes towards hitting our goal of raising $20,000 tomorrow night. Check out the Family Worship Center website here. And like their facebook page here. FUNDS RAISED SO FAR... $16,450!!!! I'm excited to announce that we have a $1000 Platinum Level Donation for our Annual Banquet. On behalf of GTD, I want to express a profound heartfelt 'THANK YOU" to Dana & Martha Ward for their incredible generosity to this ministry. 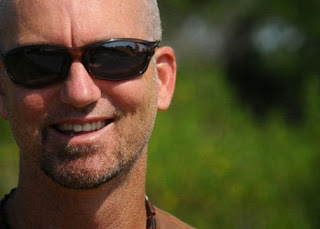 God bless you for all you do to strongly support Going The Distance Adventure Ministry. WE LOVE YOU GUYS!!!!! PTL! WE HAVE ANOTHER TABLE SPONSOR!! We have another generous Bronze Level Donor. We'd like to thank England Brothers Construction for their kind & thoughtful support of GTD again this year (and over the past several years). We deeply appreciate your generosity. God bless you! We have some generous table sponsors who aren't able to fill all of their seats, but would like to donate their extra tickets to anyone who would like to attend. Our Annual Banquet is this Tues night (Nov 13th) at Ruth Eckerd Hall (6:30pm-9:00pm). Dinner is included. 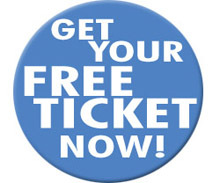 Simply email us at info@goingthedistance.org if you would like to claim one or more tickets. WE HAVE A $3000 DONOR MATCH CHALLENGE!!! One of our donors (who would like to stay anonymous) has offered to match all the one-time donations we receive up to $3000!! That means that for every dollar you donate, they will double it!! So if we raise $3000 it will become $6000!! 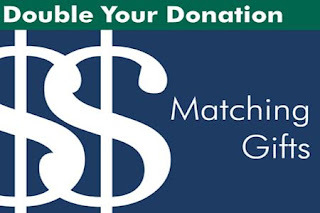 Our deep heartfelt thanks & appreciation goes out to our Donor Match contributor. God bless you for your kindness & generosity to this ministry!! Praise The Lord!! Also, this is a great time to sign up to be a 2013 Monthly Partner. Sign up to support GTD for only 12 months. It's a great way to make a big difference all year long!! 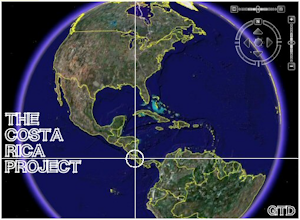 Click here for donation information on the GTD website. 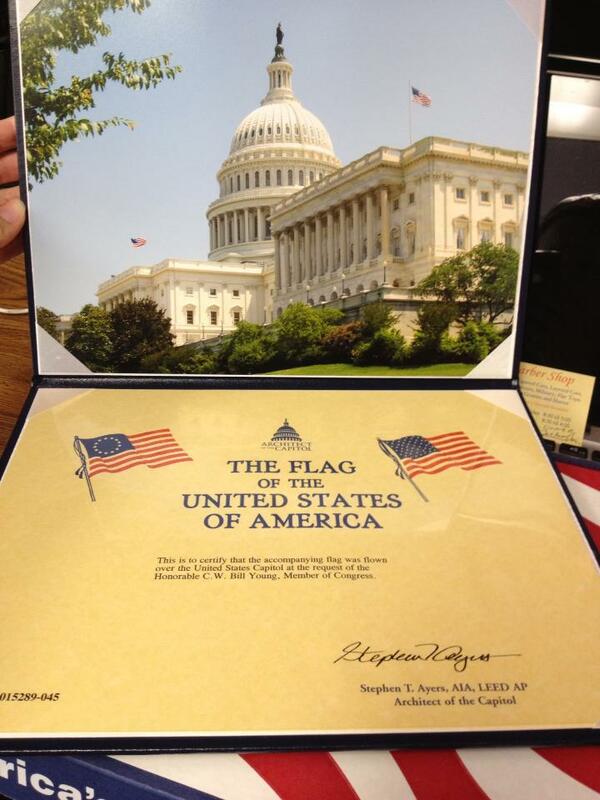 Just received an American Flag from Congressmen Bill Young's office for the banquet. It will be a silent auction item. The winner gets to choose the day they would like it flown over The United States Capitol! I'm blown away by the donations coming in for our banquet! Today we received several more including the United States Flag, massages from Massage Envy, a haircut at the 66th St Barber Shop, tickets to a show at Ruth Eckerd Hall for Valentines! And.... the other day Amanda Briody Paolillo donated a gift certificate to Caress A Salon for a Cut and Style, Jerry Garner donated a deep friend or smoked turkey for Thanksgiving and we got tickets to Weeki Watchee Springs, Bok Tower and The Ringling Museum of Art!!! It's going to be a great night....be sure to RSVP to the banquet if you haven't already! Check out GTD's 2013 Public Event Calendar... hope to see you on some of our God-awesome events next year!! 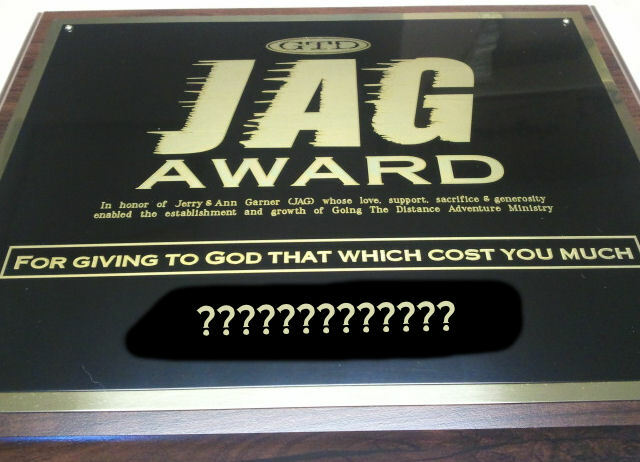 The JAG Award is GTD's highest recognition award. Each year we present it to the person, church, business, or organization that has had the biggest impact on our ministry over the past 12 months. We will be awarding it this Tuesday night during our Annual Banquet to........ well, you are going to have to attend the banquet to find out who the recipient is =). "In honor of Jerry & Ann Garner (JAG) whose love, support, sacrifice & generosity enabled the establishment and growth of Going The Distance Adventure Ministry"
"FOR GIVING TO GOD THAT WHICH COST YOU MUCH"
2 Timothy 3:12: "In fact, everyone who wants to live a godly life in Christ Jesus will be persecuted." 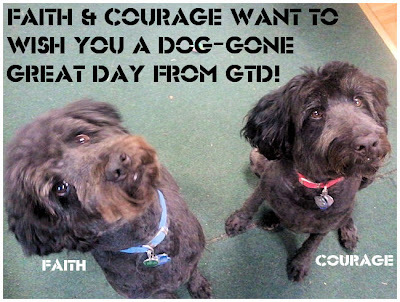 The GTD Dogz hope you don't have a "ruff" day today. Be blessed! 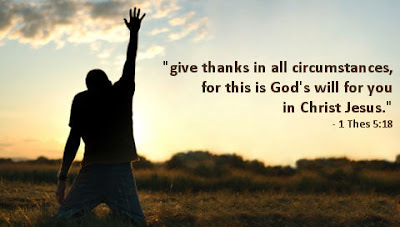 We have so much to celebrate in Christ! As a ministry we have so much to be thankful for! One major thing we are thankful for is that we survived a near death experience... we survived The Great Recession! That's not to say that everything is smooth sailing now, but we have slowly returned to stable condition. This is no small task and nothing less than a reflection of the grace of God. According to the U.S. Census Bureau over 270,000 small businesses went out of business between March 2007 - March 2010. That's more than a quarter of a million businesses that died! GTD was not one of them. We got hit hard, but we lived to fight another day. 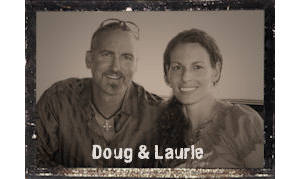 In the summer of 2009 we hit rock bottom without warning as participants & groups abruptly cancelled events with our ministry due to their own personal financial woes. That loss of income and the continued projection of lost income nearly knocked us out. I often describe our situation as a near death experience. In financial terms we were in the emergency room with profuse arterial bleeding. Our pulse was faint and our blood pressure was dropping fast. We needed blood donors STAT! Incredibly, a couple who wants to remain anonymous showed up to the "ER" with a $20,000 zero interest loan that served as a gauze pad to stop the bleeding. 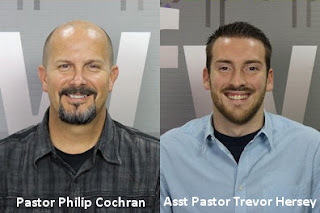 God used them to save the life of this ministry. As our blood pressure and heart rate began to stabilize we had to make some difficult decisions to keep from bleeding out again. We had to minimize expenses at all costs. Since we run a very lean ministry the only option we had was to eliminate salaries. 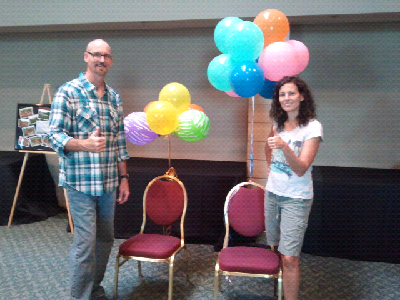 That meant we had to let go of our entire 6-person paid staff, including myself & Laurie. The two of us stayed on as full time unpaid volunteers in order to repair the damage, but we lost all of our full time help as well as many volunteers who had to tend to their own personal needs. In order for Laurie to do this she moved into a spare bedroom in my parent's house (and sometimes at my sister's house). She has become a nomad. As for me, I continued to live in a spare room in the GTD office. It makes my commute to work pretty fast! Since then we have both begun to receive part-time salaries. 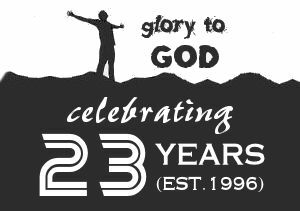 Over the past 3 years we have poured our lives into this ministry to get it back in good health. I'm blown away by the generosity that we've seen from our donors. Usually 70-80% of our annual income comes through what we charge for our events which means that 20-30% of our remaining budget comes through contributions. 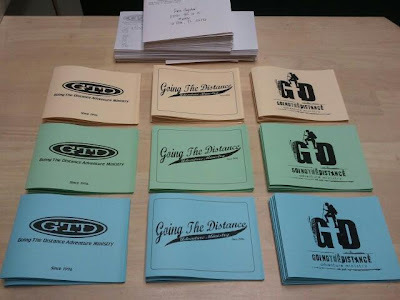 In 2010 groups still weren't able to sign-up for events like they had in the past so our donors increased their contributions to cover 45% of GTD's revenues and help make up for the lost events. My jaw is still dropped about this fact. During the most difficult economic time in our country since The Great Depression, we had an abrupt increase in donations. It was also during this time that our vans died from a blown engine and a blown transmission. 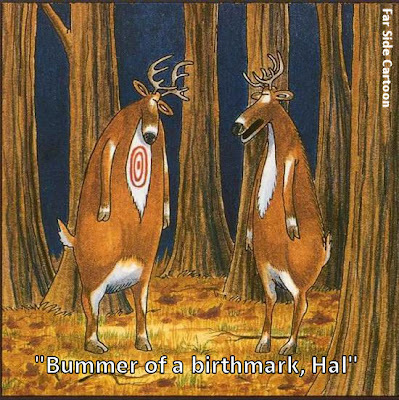 They were too old to repair so we sold them for salvage. I was looking into rental vehicles when an incredible couple went out and bought our ministry a pre-owned 2005 King Ranch Edition Ford F-250! It wasn't an extra truck they had sitting around. They assessed what we needed and went out and bought it for GTD and dropped it off at our office. I'm still speechless about that. They're generosity floors me. And to top it off, we had 2 other incredible donors that donated trucks to GTD (Jerry Mullins & The City of Pinellas Park). Each one has been an enormous blessing to our ministry. 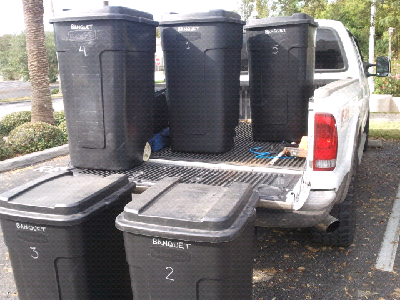 Somehow we went from 2 vans to no vans to 3 trucks in about 4 months! That is the power of God! That is God on a rescue mission. Each year God surprises us with another miracle, another way that he moves the heart of others to support this ministry. 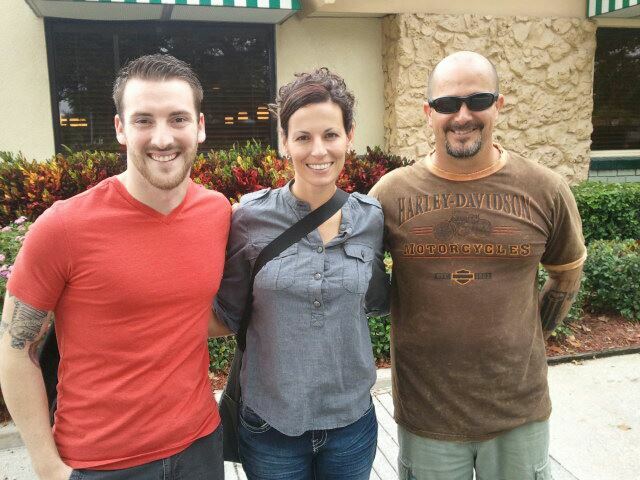 Earlier this year an amazing couple, that asked to stay anonymous, handed me a check for $10,000 made out to GTD. They wanted to bless this ministry... and they did just that! It humbles me; it moves my heart. It leaves me speechless. Then to add a cherry on top Celebrate Pinellas Park donated $1000 to GTD last February. It touches my heart more than I can express to see God move in the hearts of people during these tough economic times in order to strongly support this ministry. We are not quite back to where we need to be, but we have stabilized. We are still making huge sacrifices and working day and night to get this ministry to great health. Even with the great testimonies I just shared we still need to raise $20,000 at our Annual Banquet in 2 weeks. The great news is we can go another year with that $20,000! God does a lot through this ministry in one year with that little amount. God continues to make an eternal impact in a lot of young people's lives all year long through our programs. We look forward to highlighting some of these at the banquet. I want to invite you to be a part of our special night at Ruth Eckerd Hall on Nov 13th. It's always a fun and encouraging time as we celebrate what God has done over the past year and prepare for what He has in store for the next year. I also invite you to partner with us financially by sponsoring a table, making a one-time donation and/or becoming a monthly partner for the next 12 months. Even if you can't come to the banquet you can still support GTD. Every dollar is an investment in someone's eternity. Thank you for taking the time to read this letter & supporting GTD. I hope to see you soon at our banquet or on an event. TAMPA COVENANT CHURCH'S MEN DO THEIR OWN STUNTS!